Irrespective how domain knowledge is well formalized, and irrespective of applying appropriate pedagogical techniques in Intelligent tutoring system, learning and teaching process can seem complex because of unfamiliar communication with computer tutor. Using even simplest NLP techniques makes benefits in computer‘s usage, not only in e-learning domain. Natural language generation is basic technique which can make learning and teaching process much more adaptable to the student. Presenting formal knowledge by natural language sentences, as well as testing in a form of dialogue are aims to be accomplished in new Intelligent Tutoring System based on Tutor-Expert System model. In making previous system more acceptable to the student, our first step is to perform natural language generation with Croatian localization for formalized domain knowledge following by problem generation and dialog based guidance to the problem solution. 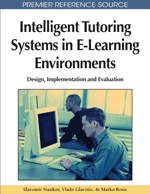 Intelligent tutoring system (ITS) is a kind of e-learning system which provides tutoring based on one-to-one scenario. Computer plays a role of tutor and guides student in assimilation of knowledge, skills and abilities. ITS modal architecture contains expert module which, as typical expert system, implements some domain knowledge using particular knowledge representation technique. Pedagogical module is responsible for applying teaching techniques over knowledge, and in doing so relays on the student model. Communication module is in relation with teacher module and provides interface for the student. Applying natural language interface in communication module, even in a basic form, greatly improves learning and teaching process (Di Eugenio & Trolio, Can simple Natural Language Generation improve Intelligent Tutoring Systems, 2000) (Di Eugenio, Fossati, Yu, Haller, & Glass, 2005). Great influence on natural language processing (NLP) in ITS has domain knowledge representation. Usually ITS’s are strictly specialized over some domain knowledge representations making NLP knowledge dependent. Besides, majority of natural language based ITS’s incorporate dialogue exclusively as an only way of tutoring the student. Even so, these dialogues have different approaches depending on a knowledge representation. Today’s most robust and fluent dialogue is probably utilized in AutoTutor (Wiemer-Hastings, Wiemer-Hastings, & Graesser, 1999). Robustness of AutoTutor is outcome of using statistical model of world knowledge containing large text corpora. Statistical approach to NLP in AutoTutor is based on latent semantic analysis of a large text corpora, and as every statistical approaches, has no ability to control outcome. Perhaps all that can be made better is to train computer tutor with specific examples, in the hope of enhancing results. CIRSCIM-Tutor (Glass, 2000) has finite state syntax approach where dialogue is generated using finite state transducers and is limited on a few simple words as an answer on tutor’s question. Casual concept map in CIRSCIM-Tutor contains concepts described by a few words and relations for determining causalities. Simplicity of dialogue in this tutor is an effect of such knowledge representation. Frame-based semantic approach in Atlas-Andes (Rosé, 2000) can capture deeper meaning of natural language sentences presented or inputted by the student. On the other hand, semantic network with frames has basic inheritance mechanism which is insufficient for constructing complex logical expressions. Aim of our research is to make model of Tutor-Expert System (TEx-Sys) (Stankov, 1997) more acceptable by students. Necessary step in doing so is appliance of NLP techniques. Frame-based semantic net is a backbone of all of learning and testing methodologies used in TEx-Sys and we believe that acceptability of the system will be significantly increased if this knowledge representation is going to be extended with logic formalism and if NLP is going to relay on it. Basic idea of applying natural language process in ITS is refitting TEx-Sys model by replacing semantic net with description logic and uniting previous testing methods (quiz and overlay) into natural language dialogue. Moreover, interface between student and ITS will be completely based on natural language. Natural language generation is essential technique for producing sentences and questions in tutor dialogue. Specifics of approach described in this article greatly relays on description logic for defining structure of formal knowledge expressions as an basis for natural language sentences. These formalized expressions are inputs for generating questions and recognizing student’s answers during test in form of a dialogue. Computer tutor takes role of a dialogue manager, and is responsible for guiding student during execution of dialogue. Besides generating questions and recognizing answers, computer tutor dictate updates of the student model. Proposed student modeling is relaying on basic overlay model (Carr & Goldstein, 1977), as well as, model presented in TEx-Sys. Enhancement of proposed student modeling are made because of new knowledge formalism applied and since different way of interaction is made with the student.